July proved to be another strong month for the property market! While price sensitivity remains a trigger point for buyers, our team on the frontline are seeing realistically priced homes on the market just a matter of days before being snapped up. Good news for vendors in the ‘Prestige’ area of the market! Over the past few years these properties have certainly been affected by global and market forces. Here are some facts I was sent just this week courtesy of Neil Bray, Executive Director, Land Services Division. Thanks to the first 6 months of 2009 we fared so much better than the outlook appeared in December. I believe that if we broke these figures down further you’d see we’ve been playing ‘catch up’ since January Ð but I’m certainly not complaining nor, I’m sure, are sellers. On the frontline it also appears we’re seeing some steadily emerging optimism amongst prestige buyers. The proof? Last month Toop&Toop sold 10 properties over the $1million mark. Now that’s a good result for the top end! In regards to another report we placed online earlier this week from RP Data, figures from the June quarter are out showing the market is performing well nation wide. Median property prices are up across the capital cities with Adelaide recording a growth of 0.4%, Darwin recorded the biggest rise at 3.9%, closely followed by Melbourne 3.7% and Canberra 3.3%. While everyone’s talked about a decline in property prices over the past 18 months, which we’ve all felt, here’s the big picture of how Adelaide’s market played out against the National prices. 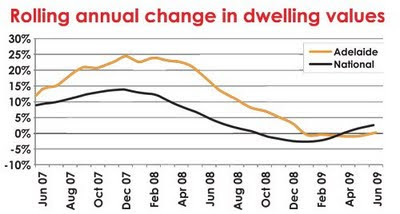 The upside is last quarter began to change the trend for Adelaide with a positive growth. What now? Well I’m starting to feel that Spring ’09 may fare ok for house salesÉ but only time will tell.